Although most people don’t think “librarian” when they think of active lifestyles, I have managed to work some fitness routines in during my work day. It helps that my office is on the third floor of the Downtown Lansing branch, so a quick workout is always just a flight of stairs away. For a workout in my free time, I always reach for my bike first. 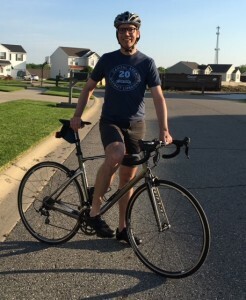 After practically a lifetime of cycling for fun and fitness, I find that I really enjoy doing “century” rides, which cover a route of 100 miles. I usually do at least one or two of these a year. The DALMAC was one of my favorites, with amazing views along Michigan’s western shoreline. One time I did a 250-mile ride that took about 22 hours. My thoughts ranged from “This is so cool!” to “This is the stupidest thing I’ve ever done.” When it was over I was sure I’d never do it again. Then about a week later I started researching other long rides! I’ve learned that nutrition and hydration are key for riding long distances. Eating and drinking properly not only helps me finish, it helps me enjoy the ride more. And learning how to do things right was easy for a library lover like me. CADL’s digital collection includes eBooks, videos and magazines that are available any time of day or night. I like Bicycling Magazine from RBdigital for info about new gear, bikes and repair tips. The GAIAM yoga videos in hoopla help me cope with daily aches and pains. For those who prefer more traditional formats, we have lots of books, magazines and DVDs on health and nutrition topics as well. Browse our complete catalog here.